Any time is a great time to gift flowers- Happy Birthday, Anniversary, Graduation, Thank You, Get Well, Thinking of You, Love You, Congratulations, Valentine's Day, Mother's Day etc. According to research by Dr. Jeannette Haviland-Jones, professor of psychology at Rutgers, flowers and flower scents promote happiness in people. Flowers create instant delight, invoke positive moods, ease depression and promote social interaction. Red symbolizes energy and beauty, Red roses mean love and romance. Yellow evokes feelings of new beginnings, lights up a mood or room, Chrysanthemums, daffodils, yellow roses mean friendship. White roses, lilies are pure and associated with humility, reverence. Tulips symbolize optimism and cheery personalities. Choose the right flowers depending on the occasion and gift them to promote happiness and to show your appreciation and love. Flowers can be very expensive, to make them more affordable, use discount coupons. 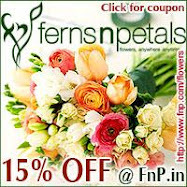 Ferns N Petals is offering up to 15% off on all purchases of flower arrangements, beautiful fresh bouquets and holiday gift hampers. 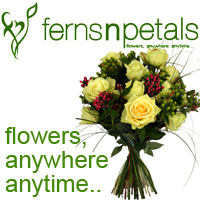 Ferns 'N' Petals established in 1994, is the country's only branded chain of retail flower shops and an online flower store providing one stop solutions for everybody's floral needs. Buy and send flowers to India or anywhere in the world and pamper your loved ones with exotic and exquisite flower arrangements delivered throughout Indian cities and a number of international centers. 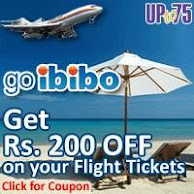 www.indiaflowersdelivery.com is offering Rs.200 or 20% off for all customers of Upto75.com on flowers and gifts. IFD (India Flowers Delivery), online floral resellers, offer you a wide selection of beautiful flower arrangements, bouquets, gifts and corporate flower arrangements. 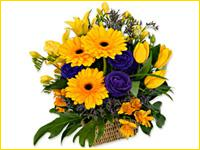 They also undertake dispatch and timely delivery of flowers anywhere in India. Apart from flowers, they also offer cakes, soft toys, chocolates and other combos. Get the most exotic combos at www.indiaflowersdelivery.com. Choco Surprise, Happiness, Love Bites, Sweet Celebrations and Sweet Rage are some of the names that catch your fancy. If you are not looking for one specific item to gift, these combos are the most appropriate choices for you. Get your loved one an assortment of gifts from www.indiaflowersdelivery.com! www.cakesnflowers.com is offering Rs.150 or 15% off for all customers of Upto75.com on flowers and cakes. Buy cakes, flowers and chocolates online and get them delivered anywhere in India including Delhi, Kolkata, Bangalore, Hyderabad, Secunderabad and Vizag. You could get the one gift your loved one needs at www.cakesnflowers.com or get a combination of them and get them decorated beautifully and dispatched too. A complete gifting plan is ready for you www.cakesnflowers.com. Flora2000 offers a discount of 15% off on your order by using promocode UPT5KB on flower bouquets and birthday specials. With Flora2000 Shopping online for all your gifting needs has never been so easy. For 10 years, Flora2000 has delighted individuals in 150 countries that have sought the very finest in flowers. From flowers to gift baskets, you are sure to find the perfect gifting selection online. Flora2000 guarantees fresh, beautiful flowers - choose to send the best for all your international gifting needs. From the initial discovery of a bouquet, to the smile on the faces of your loved ones, every interaction is a moment of truth and translates to perfection.